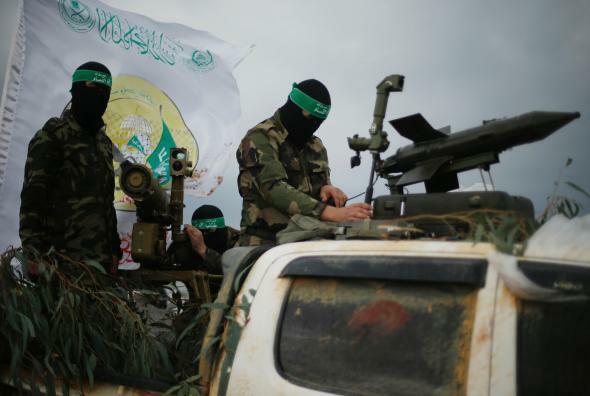 Hamas not terrorist organization: E.U. court rules. Members of Hamas’ armed al-Qassam Brigades at a Dec. 14, 2014, Gaza City parade celebrating the 27th anniversary of Hamas’ founding. The Palestinian terrorist group asserted in its petition that the decision to put it on the EU terror list was carried out without giving it an opportunity for a hearing and without sufficient evidence being presented. The European court accepted the petition based on the precedent of a similar case of the Tamil Tigers of Sri Lanka. The court ruled in its decision that most of the evidence used to put Hamas on the list of terrorist organizations were from open sources – mainly press publications. The court made it clear that the ruling does not say anything substantial about the status of Hamas or the character of the organization’s operations. Israeli Prime Minister Benjamin Netanyahu nonetheless denounced the decision, which can be appealed by any EU member state or the European Commission. Hamas is one of the 59 groups designated as “Foreign Terrorist Organizations” by the U.S. State Department.